Australian researchers are part of the global quest for better batteries and energy storage materials to help meet the world’s future energy demands, particularly for high-power applications such as electric cars. Sales of lithium-ion batteries are already worth around US$13 billion, mainly in consumer products, and electronics giant Sanyo predicted in 2011 that new applications could see sales triple to US$44 billion in 2015 with the three main market sectors being power storage, consumer electronics and vehicle applications. 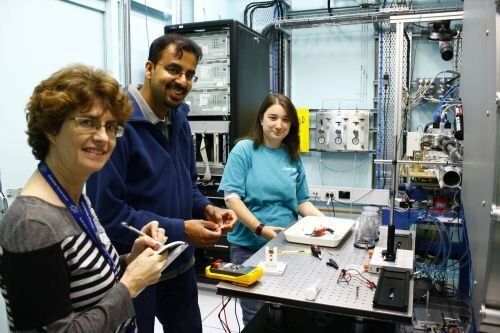 Neeraj Sharma from ANSTO in NSW and Rosalind Gummow from James Cook University (JCU) in Queensland are using synchrotron x-rays and neutron beam techniques to help them develop better electrode materials for lithium-ion batteries. The work is being undertaken in collaboration with Vanessa Peterson at ANSTO and Yinghe He at JCU. Lithium-ion batteries are lightweight, making them popular for portable applications. They can be used individually or in parallel to power devices with high energy requirements, especially for portable applications. Lithium-ion batteries have the highest energy densities of any currently-marketed reversible battery, including lead-acid, Ni-Cd (nickel-cadmium) and Ni-MH (nickel-metal hydride) batteries. They can also be made into a variety of different forms from coin cells to prismatic cells. Disadvantages of the current generation of lithium-ion batteries include safety concerns during use, performance at high and low temperatures, lifetime, environmental-friendliness and cost of construction. They tend to be expensive because external controls are usually needed to control voltage range during use and re-charge. Without this control, battery performance is quickly reduced and safety issues become very important. New applications of lithium-ion batteries include electric vehicles and back-up for renewable energy systems. These require cathode materials with higher capacity, lower cost and better safety than currently available. Neeraj and Rosalind are investigating Li2MnSiO4-type cathode materials, which have the potential to double capacity (energy density) in lithium-ion batteries. The capacity of a lithium-ion battery depends on how much lithium is in the cathode; because Li2MnSiO4 has two lithium ions per formula unit, it has a higher theoretical capacity than commercial materials. Li2MnSiO4-type materials are also more environmentally friendly than the cobalt-containing cathodes currently used. Lithium-ion batteries with Li2MnSiO4 cathodes consistently lose capacity during repeated cycles of discharge and re-charge. This is the result of factors that include amorphisation (loss of long-range order in crystalline structures) of the cathode materials when lithium is extracted. After accomplishing the difficult task of synthesising pure samples of two different crystal forms (polymorphs) of Li2MnSiO4, Neeraj and Rosalind used x-ray powder diffraction at the Australian Synchrotron, and neutron diffraction at ANSTO, to determine their crystal structures. One polymorph has Pmnb symmetry; the other has P21/n symmetry and can be stabilised at 700°C (significantly lower than previously possible) by substituting magnesium atoms for some of the manganese atoms. Having pure samples of the polymorphs means that Neeraj and Rosalind can properly characterise their electrochemical responses and determine which is best for battery performance. With cathodes in coin cells typically weighing around one to two milligrams, only synchrotron x-ray beams have the high intensity needed to obtain high quality data from such small samples and enable detailed study of subtle structural changes associated with lithium extraction and insertion processes. Neeraj and Rosalind returned to the AS in April 2012 for more in-situ synchrotron x-ray powder diffraction experiments where they followed the cathode phase evolution of these batteries while charging and discharging a coin cell battery. 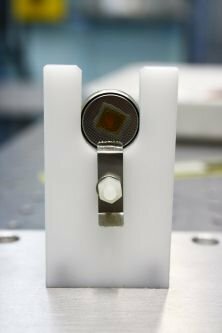 These experiments are shedding light on how the crystal structure changes as lithium is inserted into and extracted from cathode (and anode) materials. By understanding these changes, the researchers can improve their materials and hopefully achieve capacities and lithium cycling performance levels that are better than current technologies.